What trends do you see in Home Automation? I think that with home automation becoming more affordable, demand will increase. This will bring a whole new market into the mix. Home automation won’t just be for the affluent, but will be affordable to most. With prices of audio-visual equipment and general electronics declining rapidly, home automation is increasingly attractive to pursue. Users will not want to have to purchase special control interface devices to control their home, they will want to use what they already have – smartphones, tablets, PC’s and laptops. Home automation will also become less about hardware, and more about software. We are finding that his is already happening right now, the hardware is just what links everything together while the software is what provides the actual smarts. Also, as energy prices rise, end users will want to keep an eye on real time energy usage in their home. Home automation systems are already moving to embrace this technology and will continue to do so. iViewer has been very successful in the past, how will CommandFusion hardware compliment iViewer? iViewer’s success, I believe, has been largely based on our core philosophy of openness. iViewer can control and communicate with any device through ethernet, using their own protocol. CF hardware is built on the same premise. The hardware protocol is fully published, and we encourage the mix and match of any software and hardware to achieve a reliable, cost-effective result. We felt many hardware solutions were either limited, or very proprietary. Our hardware allows iViewer to now control and monitor devices in a reliable and affordable manner. What makes CommandFusion hardware different to existing control systems? 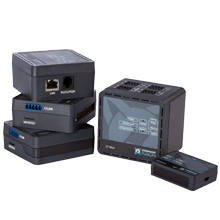 Our hardware lineup has a few outstanding capabilities that make it attractive for integrators. Modular devices allow integrators to design cost effective solutions for large scale projects, creating their own hardware mix at a low price. A single DIN-MOD4/MOD4 unit allows you to mix and match up to four modules from our range of infrared, serial, relay and I/O modules. An astonishing number of IR or serial ports can be achieved reliably and inexpensively, which was previously unheard of. To simplify setup, Device ID conflict resolution can be completely handled by software with devices online, without requiring physical access to the devices, as well as auto-discovery of every CommandFusion device installed on the local network. CFLink is rated for 9-30VDC, which allows for long cable runs to be better tolerated as a result of voltage drops.The bus is extremely reliable and tolerates miswiring and over-voltage, guaranteeing hardware integrity at setup time. All of our CFLink hardware is also peer to peer. This allows for incredibly simple programming, and eliminates any single point of failure. Finally, having our entire protocol fully published allows integrators to mix and match other control systems with ours. Why did you go down the path of creating your own BUS (CFLink) in a world filled with IP devices? Imagine a home automated with all devices on IP – Wireless bulbs, Ethernet HVAC, audio-visual devices, tablets, NASes, media servers, and so on. Would the average home user be able to manage this amount of devices and traffic? Even for experienced network administrators, IP addressing, traffic issues, wireless intermittency – these are just a few of many network management realities. All network devices must be connected to a switch, increasing cable costs and points of failure. CFLink was designed to make life easier. We wanted a reliable bus that could be used purely for automation, independent of the IP network and the restrictions placed on IP network access in commercial environments. CFLink allows Cat. 5/6 cables to be used with a mix of star and daisy topologies with individual runs over 1km without a need for repeaters. 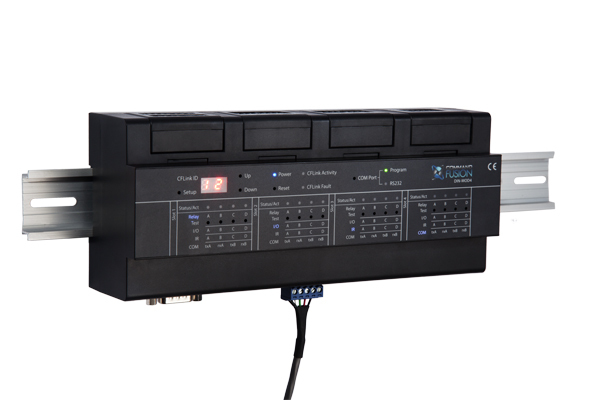 The LAN Bridge then makes the automation system accessible on the IP network and allows all the convenience of IP control without either interfering with the network or failing when network issues arise. You offer a 5 year warranty on all hardware, with so many throw away electronic devices around – how are you so confident in your product? We started developing the hardware range in 2008. Very early on, we focused on reliability as one of the main goals. We were constantly redesigning the electronics and physical components of the hardware to ensure that the hardware will last. The hardware has been put through many tests to try and cause it to fail, and they just keep on running. As mentioned earlier in what differentiates us from other hardware is our commitment towards engineering for common causes of failure such as over-voltage and mis-wiring. Our confidence in hardware is backed by millions of hours of rigorous testing prior to our product being put on the market, hence our five year warranty. What Markets does CommandFusion currently cover, and what markets do you see as being accessible in the near future? Currently our target market is custom integrators, and these integrators in turn install our products into a number of different sectors including residential. Our software and hardware can essentially be used in any market, but we are focusing heavily on the commercial market right now. The modular nature of the hardware allows the system to be customized to suit each individual situation. I’ve heard that you offer OEM software services, how does this work with your software products? iViewer is a very versatile tool – it essentially allows us to create a custom mobile device app much quicker than designing one from scratch. We can provide a service that will turn iViewer into your own dedicated application to download from the app store. This application could do anything, from simply being a rebranded iViewer offering, to being a dedicated app for controlling a certain hardware range with device auto discovery and configuration. This service is usually much cheaper and quicker than designing a dedicated application from scratch. Anyone can contact us directly for more information. Do you have any plans to support wireless gateways such as z-wave or Zigbee? Whilst I try not to talk about future products too far in advance, it is certainly on our roadmap to support wireless protocols. With standards such as Z-Wave and Zigbee, we would prefer the use of existing third party gateways through our LAN Bridge or RS232 interface, rather than to reinvent the wheel so to speak. Why would I use iViewer with Crestron, Control4, AMX, etc. when they have their own touchscreens and Apps? In today’s home automation setups, devices from several brands and using different controlling protocols are frequent. The apps provided by other manufacturers allow you to only control their hardware – iViewer’s versatility lets integrators create a single user interface that controls any Ethernet system. Are CommandFusion products available to DIYers? Anyone is able to purchase CommandFusion products directly from our website. While at the moment our target market is mainly integrators, we are constantly developing the hardware and software to be more accessible to a wider audience. Developing better, more accessible documentation is part of our effort to make the product more accessible to all users, although the integration and DIY markets have different requirements and we will take this into account. Jarrod has spent the past 10 years focusing on user interface (UI) technologies and is responsible for launching CommandFusion iViewer on the Apple App Store in 2008. He heads the development and evolution of all CommandFusion software. Jarrod graduated from Monash University with a Bachelors Degree in Multimedia Computing.